What Is This Big Bison of Which You Speak? How did my adorable husband come to be known as the Big Bison? Well it started many moons ago, at Pam’s Truck Stop in Lebanon, TN, on the way to the VFW. Think I’m joking? Oh, no, my friends. You can’t make up stuff like this. Before we were married, my dear husband played in a bar band, that had a regular gig at the Veterans of Foreign Wars post in Lebanon, TN. It was actually a really good band, because we lived in Nashville, where good musicians are a dime a dozen. Anyway, on the way to the VFW,the only building in Lebanon, TN with a tank parked out front, you passed Pam’s Truck Stop, and instead of having a tank parked out front, Pam had a bison. It was a big bison. A really big bison. This cracked up my dear husband (who was only my dear boyfriend at the time) and the other members of his uber cool band. They were so cool, they all wore mullets. My friends, (spoken in my very best John McCain/old person’s voice) it was the early 80’s. Face it, if you were alive then, we ALL wore mullets. Well, at least those of us who were uber cool did. 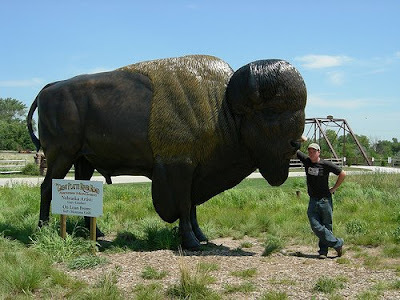 So the uber cool guys loved to joke about the Really Big Bison at Pam’s Truck Stop in Smyrna. And years later, when my dear husband began writing music, and needed to name his music publishing company, he flashed back to the early days, and a Big Bison was born. And doesn’t THAT sound painful? So, there you have it, the Saga of the Naming of the Really Big Bison. 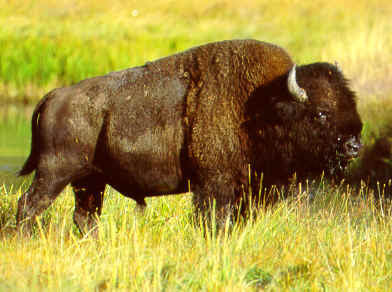 He’s MY Really Big Bison, and I love him in a Really Big Way. Really.